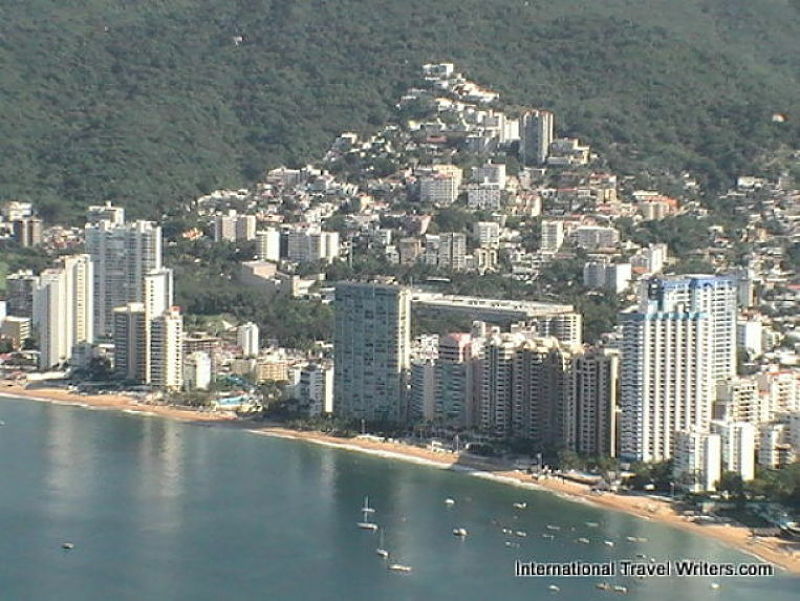 Having lived in Acapulco in the late 70’s for a year, I was well aware of its lengthy history. 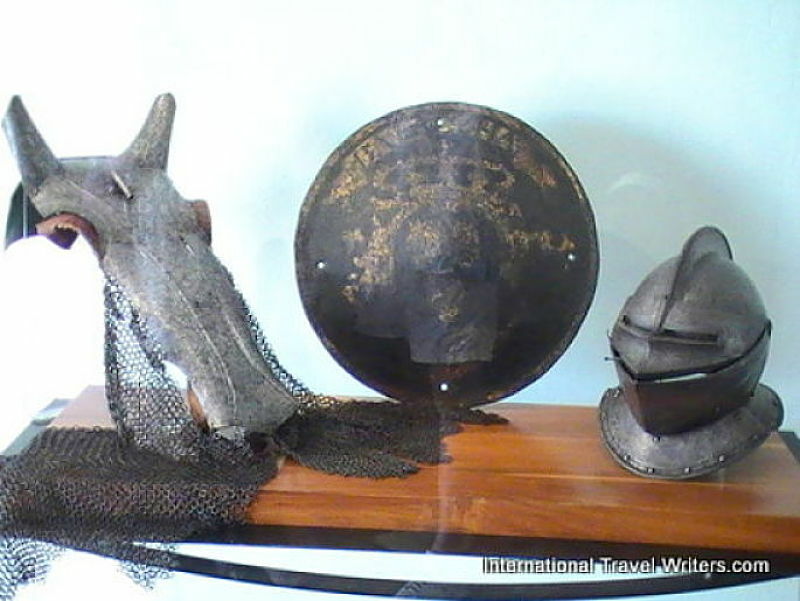 Cortes established it as a major port by the early 1530’s so it goes back centuries. 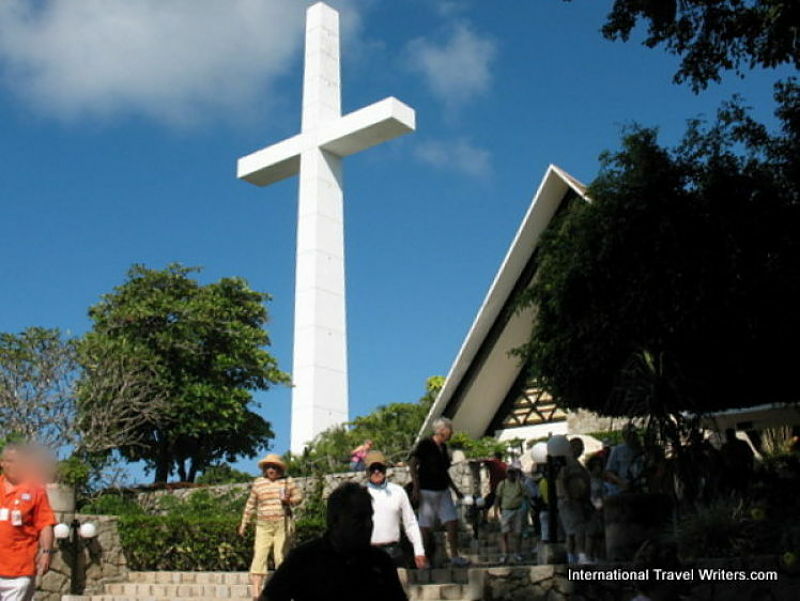 When I lived there it was still a major tourist destination for international visitors. It had reached a significant prominence in the 1950’s as the place where Hollywood stars and millionaires vacationed on its exotic beaches and some, like Merle Oberon, bought huge mansions overlooking the sea…with private moorage for their yachts. Ester Williams had a home there. At one time Johnny Weissmuller and John Wayne owned a hotel, Los Flamingos, on the northern end of the bay. Liz Taylor got married …Elvis Presley made the movie “Fun in Acapulco”…John & Jackie Kennedy spent their honeymoon there…Orson Welles and Rita Hayworth filmed Lady in Shanghai…John Huston filmed the African Queen with Humphrey Bogart. The Clintons honeymooned there. Then the discos took over, plus Liz and Burton had made Puerto Vallarta the "place to be" since the "Night of the Iguana" in 1964. 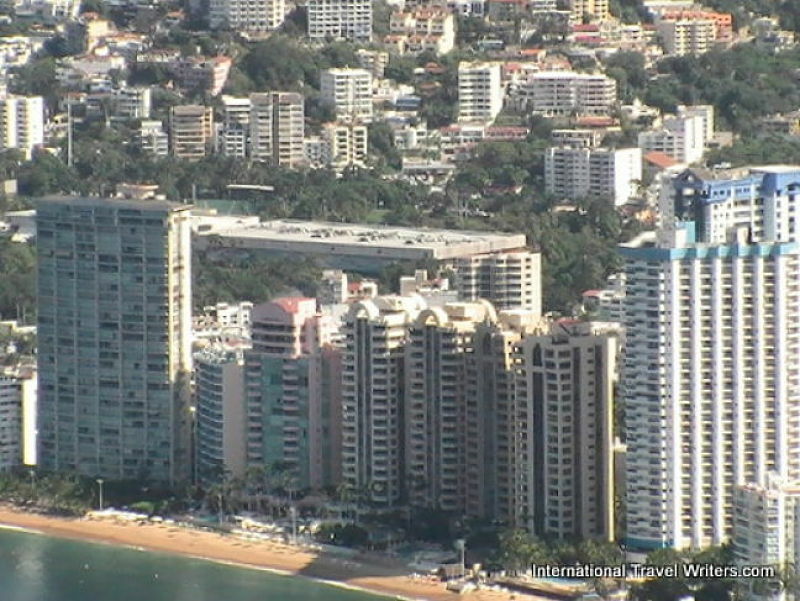 Acapulco was devastated by Hurricane Pauline in 1997. Tourists were stranded and 30 foot waves along with 150 mph winds left over 100 dead in the city and others swept away. Then in the 2000’s the drug war in Mexico had its negative effect. Soldiers started fighting the cartels in 2006 and in the summer of 2009 in the “Old Acapulco” seaside area there was a gun battle that lasted for hours. Along came the Swine Flu which hurt the economy…then in 2010 and into 2011 gang violence continued with more deaths and gruesome headless bodies dumped in a shopping plaza. On August 20, 2011, Mexican authorities reported that 5 headless bodies were found in the city’s main tourist area and a couple of the bodies had been cut into multiple pieces. Unfortunately, the horror stories have continued with 15 heads being found in a sack at an Acapulco shopping center. The result is that most of those occupying the hotels are Mexican nationals from Mexico City or other parts of Mexico. So far there hasn’t been much success with the officials cleaning up the drug trafficking problems. Was this a city I wanted to return to? Not really. I had some fond memories but with all the crime it had lost its appeal to me. 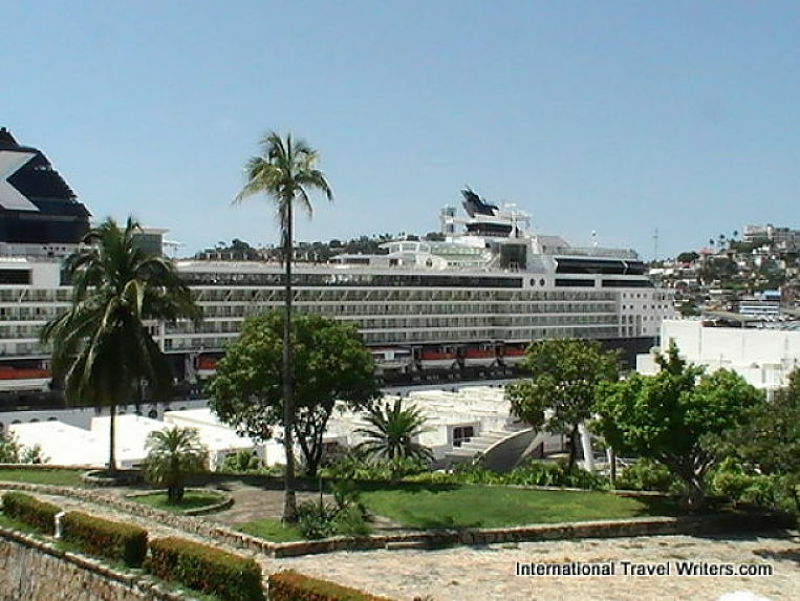 But, when on a cruise there are excursions with lots of other people so it is relatively safe. We opted to take one of the tours, partly because my curiosity was piqued. While we waited for the show we sauntered into a top tier jewelry store with some amazing pieces of silver. 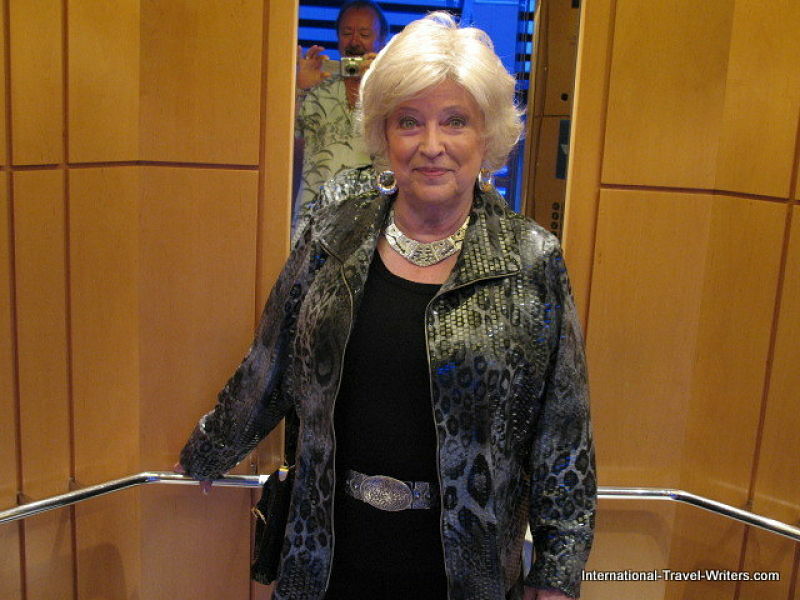 After a little haggling I bought a fabulous necklace and earrings that weighed a ton (shown here back on the ship in the elevator heading for dinner). We also purchased a magnificent silver lion that was extremely heavy. I had to carry it in my carry-on bag when we were flying home because it would have made our luggage overweight. 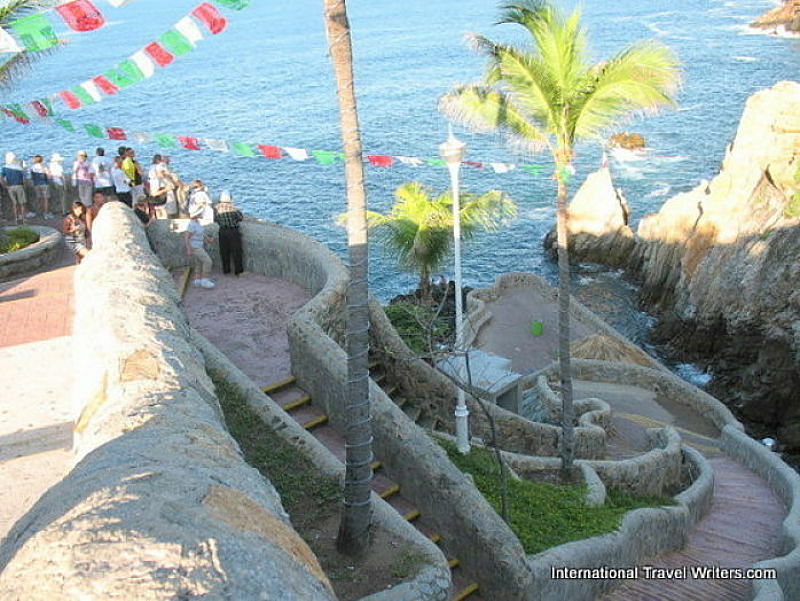 Our first stop was to see the Cliff Divers at La Quebrada alongside the old Mirador Hotel. 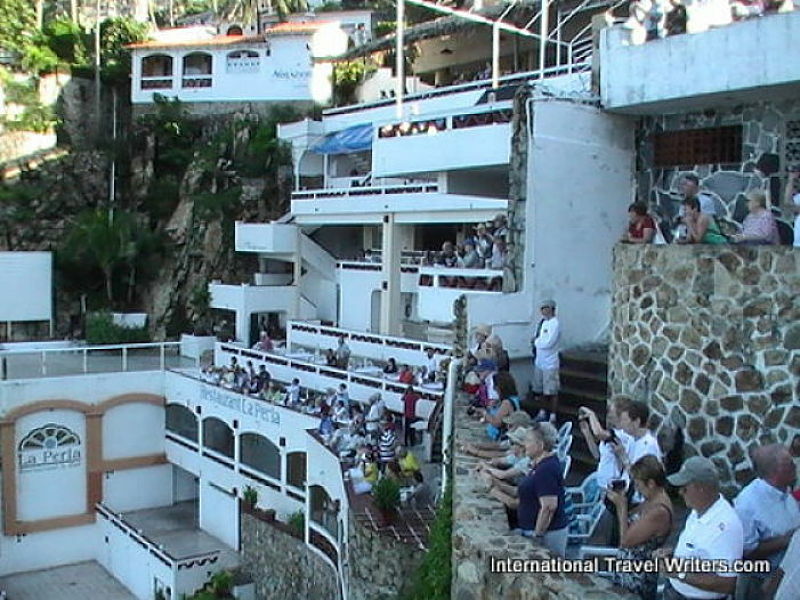 The shows are daily and the divers plunge 125 feet from the cliffs into the sea below. The depth of water in the “Gulch” (where they break into the water) can vary from 6 to 16 feet depending upon the waves so timing is critical. La Perla is an old bar that is still in existence and provides seating for the show if you’re willing to buy a drink. To get a closer look at the divers as they prepare to dive and during the plunge, there is a path winding down the cliff for tourists to get a prime view. 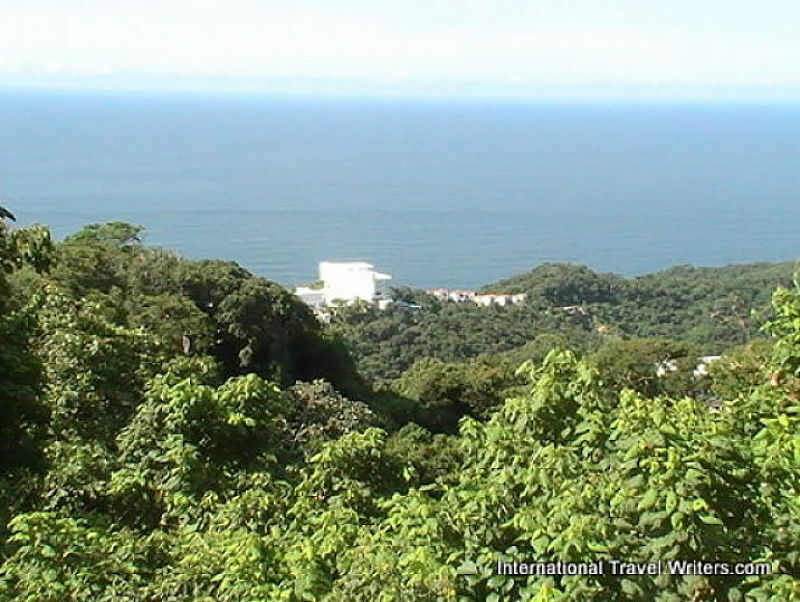 Our tour continued with a drive through the Las Brisas area high up in the hills overlooking Acapulco Bay. During the drive we saw the legendary Las Brisas Hotel with its signature pink color dotting the hillside. We stopped at the Chapel of Peace, built by a couple who had resided in the area for many years. It was to honor their son who had died in an accident. The panoramic view was amazing from many vantage points. The lush green foliage framed the sea beautifully. It was beautiful and serene in the hills. We had been tempted to drive 25 miles out of town to Pie de la Cuesta, an idyllic beach to lay in the sun or head for Playa Revolcadero for horseback riding in the surf which is quite enervating but given the possibility of dangers existing without the protection of the crowd in the tour...we were here. 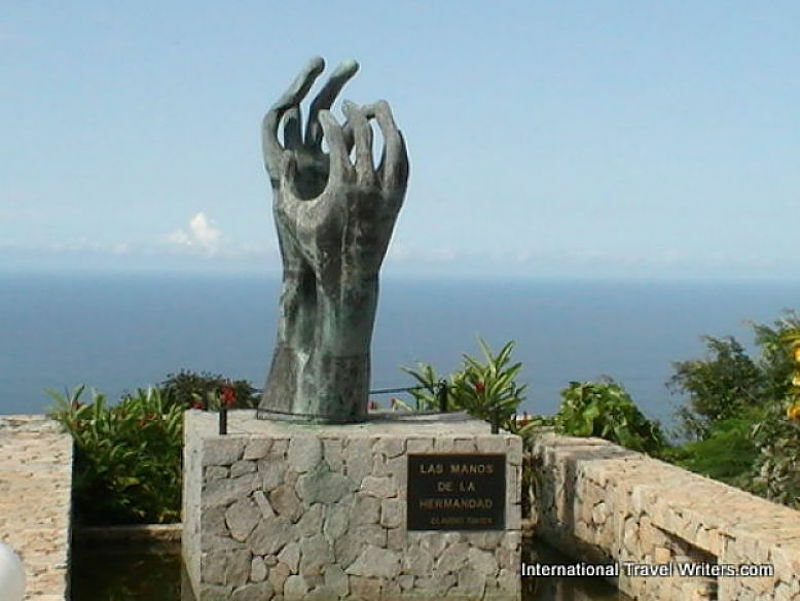 There was a bronze sculpture called “Las Manos” that dominated an area of the gardens. The next stop just down the road from the chapel was the Flamingo Hotel. 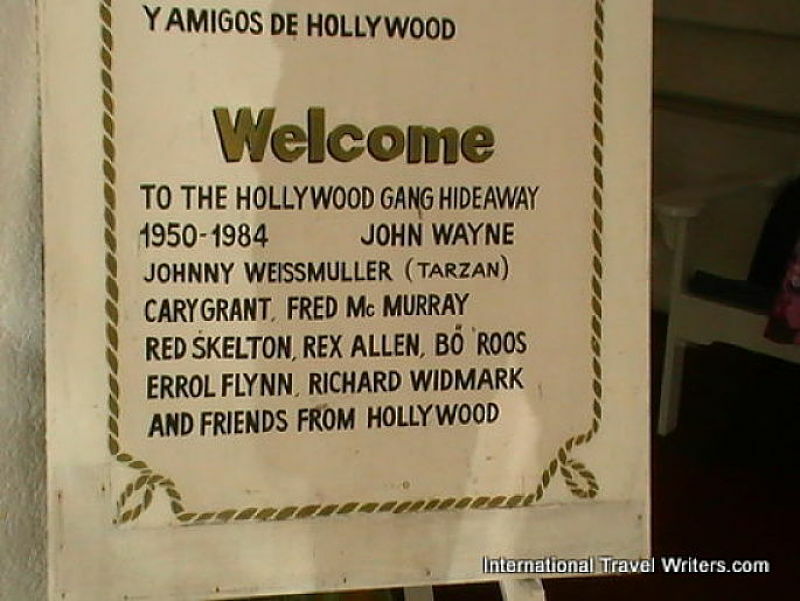 It was once a famous hangout of John Wayne and Johnny Weissmuller who had owned it. It was a brief stop and the sign outside the dining room where we had our snack proclaimed the connection. 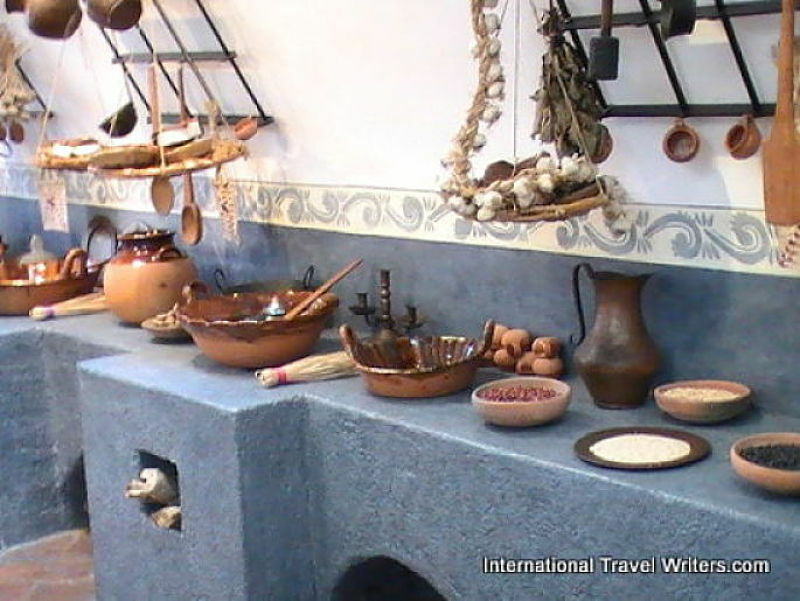 Following lunch there was a stop at the Acapulco Museum of History which had artifacts from not only the Aztec era but later times. 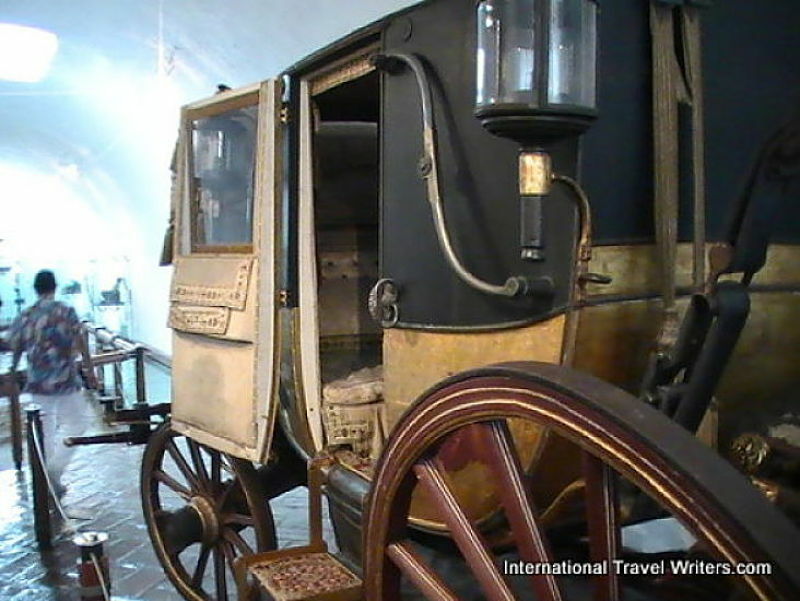 Some armaments from the Cortez days were on display in the Fort of San Diego as well as a carriage from the 1900’s. The historic San Diego Fort is located on a hill overlooking the harbor. 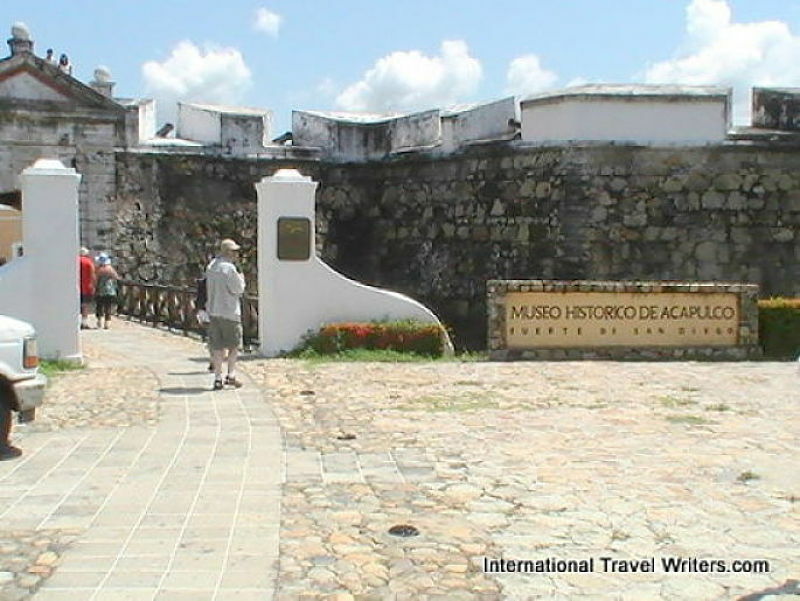 It was built in 1616 and then had massive renovations after a 1776 earthquake. All in all, considering its age it's in pretty good shape. 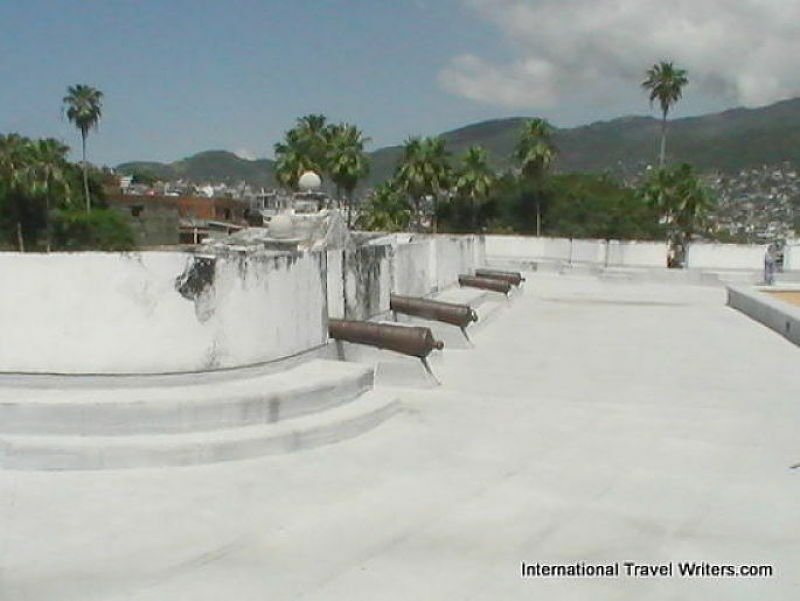 From the ramparts above the Fort San Diego we could beyond the ancient cannons and see our cruise ship in the harbor. We boarded the tour bus to return to the ship. 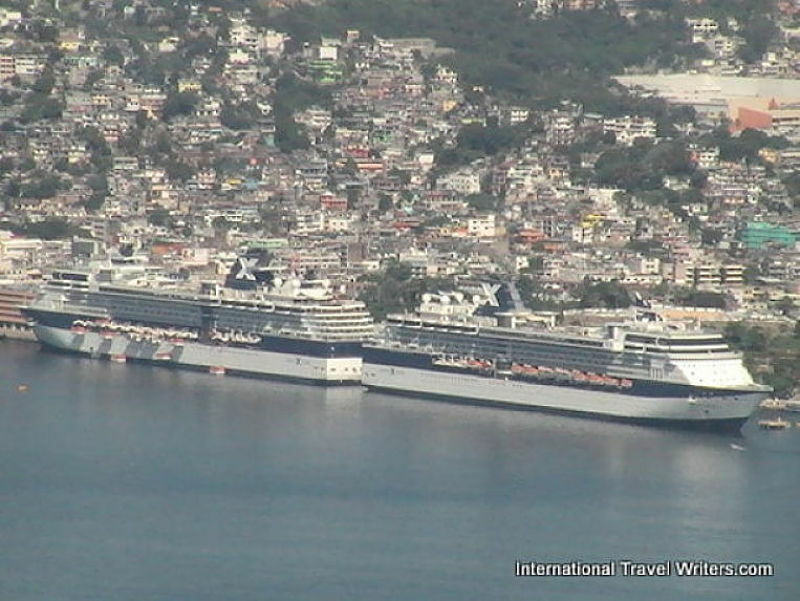 We would continue our trip south from Acapulco toward Panama the next day. However, if we had remained we would have stayed at either the newly renovated Grand Hotel Acapulco that friends had recommended...or the retro-chic Hotel Boca Chica that had also been updated since I stayed there many years ago. Or, there was the cliff-top Banyan Tree Cabo Marques with its Banyan Tree Spa. We hoped that this country would get its act together and clean up the drug mess so that their economy could be infused with the benefits of tourists spending their money there. If and when that happens, I'd be willing to return and create new memories while remembering the good ones from many years ago.